Lego is making great strides forward in mixing the worlds of play and collectability. And now they're teaching equality of the sexes! Gali is the only female Toa and incredibly wise - perhaps wiser than all the other five Toa put together. She is the most agile and gymnastic of the six Toa, with incredible jumping abilities and her own brand of acrobatic self-defense. Gali is at home both in and near the waters of Lake Naho, swimming quickly through the waterfalls that plunge down into the icy water and using her two hooked arms to grab onto rocks and cliffs. She works in harmony with the waters, which help to protect her in times of danger. 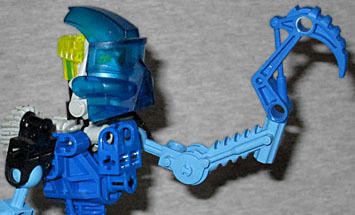 Gali, the Toa of Water, is part of Lego's new Bionicle line. For more basic information on the world of Mata Nui, read our primer course on the whole series. Gali was my third Toa, and I think I see a pattern here - I was drawn to the figures that had something unique to set them apart. Kopaka had the technological mask, and Pohatu's action feature was in his legs. Gali, in addition to being the only girl in the group, had the translucent Kaukau mask of water. 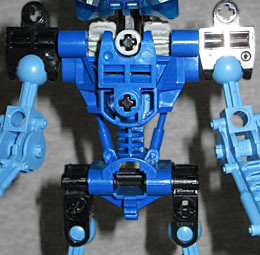 Lego's big claim to fame has always been their modularity, and the Bionicle line is no exception; each of the robots' have pieces cast from the same mold, only in differing colors, so you may think that if you've got one, you've got them all. However, that is definitely not the case. Each of the Toa have an action feature controlled by a series of gears mounted in their shoulder and on their back. Both of Gali's shoulders, however, contain gears; both her arms move when you turn the dial on her back, which does a great job of simulating swimming. While you may laugh at the notion of a female robot, the designers actually did a bit of tinkering to make her stand out from her brothers - a few extra pieces at the top of the legs and a differently-shaped breastplate do a half decent job of conveying wider hips and a deeper chest. Lest you think she's the weakling of the group, Gali's weapons are two large claws, each nearly as long as her arm. The balljoints that connect her limbs to her body also allow for a more feminine posture when displayed. 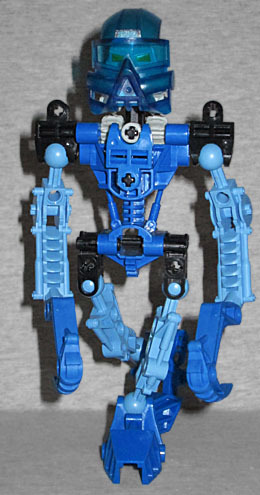 The figure is built from a deep blue torso, mask, hooks and feet, lighter blue limbs and a gray head, and a translucent yellow "brain" that also shows through as eyes. Comprising 35 pieces in all, set number 8533 stands approximately 6¾" tall when fully assembled.